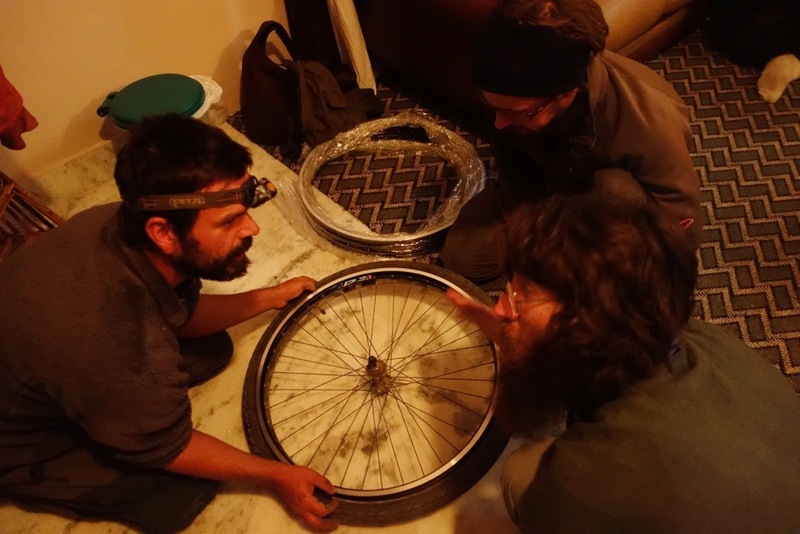 During my few weeks in Pokhara I was lucky enough to meet other cyclists, who, like me, are doing world tours. There were two couples (both Swiss) and a single Swiss man, all in their thirties, who have been on the road for varying amounts of time (one and a half to three years). The six of us hung out on multiple occasions, and even celebrated Christmas together. There seems to be an automatic bond between us cyclists as we are living the same lifestyle and can compare stories and anecdotes that “normal” people just wouldn’t understand. After the third or fourth evening together I realized that our conversations were quite different than those I have with other people, so I decided to share what an outing between cyclists looks like. First, to set the scene, an incredible amount of food is always present because us cyclists love eating more than anything else. Talking about food we miss from back home is also a staple of every hangout. -The men spend hours every single time we are together discussing bikes. I mean seriously, how much is there to discuss?! Somehow us girls (who opt instead to sit around drinking tea) always find them huddled outside around the bikes no matter how cold or dark it has become. I mean us girls love our bikes as well, don’t get me wrong, we just don’t feel the need to discuss every screw, peddle, or spoke that makes up our lovely travel partner. -While the men endlessly discuss bikes, us girls all seem to want a garden and a kitchen. After spending months (or years) with farming families around the world, it just kind of seems natural for us all to have our own wonderful garden someday in order to be at least partially self-sufficient. And don’t get me started on the kitchen idea. 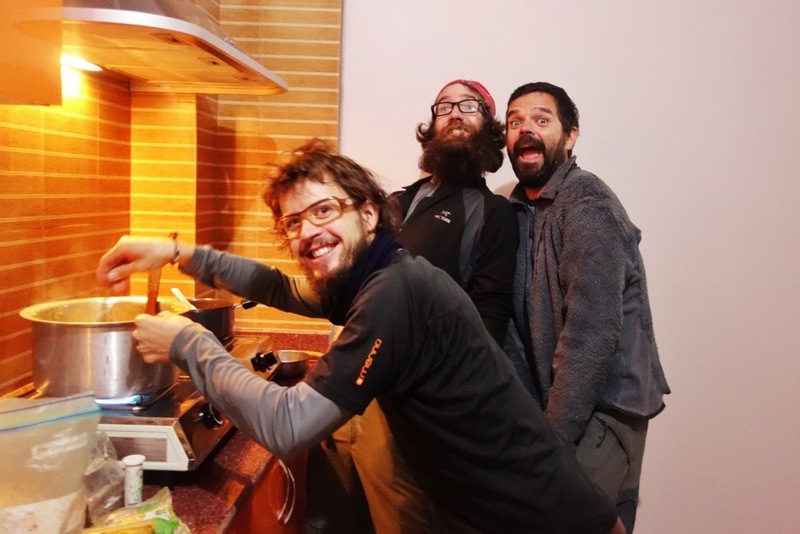 You have no idea how much it would mean to us to actually cook and bake after eating endless packets of soggy noodles boiled over our backpacking stoves. -We spend a lot of time talking about how happy we are to have “escaped the prison of normal life.” We discuss the ridiculous idea of working all the time only to have weekends off, and how much money most people in the west waste on new TVs, shoes, or other pointless unnecessary items (which is why they have to keep working, for money to buy these things). We talk about breaking the norms most people feel confined by, and we discuss the joys of simple living. -We discuss how it isn’t our careers, but rather our passions, that define us. That even when we eventually “return to normal life” (something brought up with varying amounts of fear) we will make sure that our whole life doesn’t spiral down to just our career. We talk about the fact that even when (or if) we have a “normal life” (job, children, house) we will still see the world through a different pair of glasses, our travel lenses, which will lead us to live happy and simple lives wherever we may be. And anyways, as one of the cyclists pointed out, we all now know that at any point in our lives we can pack up again and restart our lives on the road, which makes the idea of “settling down” less unnerving since we know it doesn’t have to be permanent. -We laugh how others think we are crazy, since in our minds, it is everyone else who is crazy for not doing what we do. -We all hate phones. Seriously. After not having one, and actually being free, we all dread the day when we too will have to carry one of those awful things with us again. I loved spending time with these amazing people, and I can’t wait to meet more cyclists as my journey continues. It is definitely something special to meet other people who share the same beliefs and lifestyle.. other people who get it. They get living in a tent, eating endless packets of noodles, and the uncertainty of where you will be tomorrow. They get simplistic living, and cultural differences, and the profound happiness only this freedom can give you. 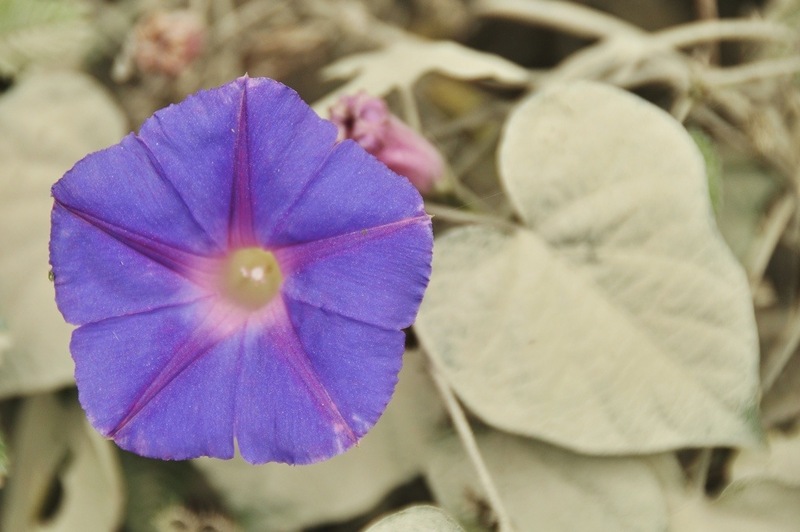 They get life on the road, the hardships and mishaps, but most importantly, the simple joys of it all. Even though there are couches in the apartment we were visiting, we all still felt more comfortable sitting on the floor. The men in the kitchen! And the women as well. While the rest of us were eating our Christmas appetizer, the three Swiss men were huddled around the wheel discussing the new rims. I am sure this delightful discussion will continue for the next few days. 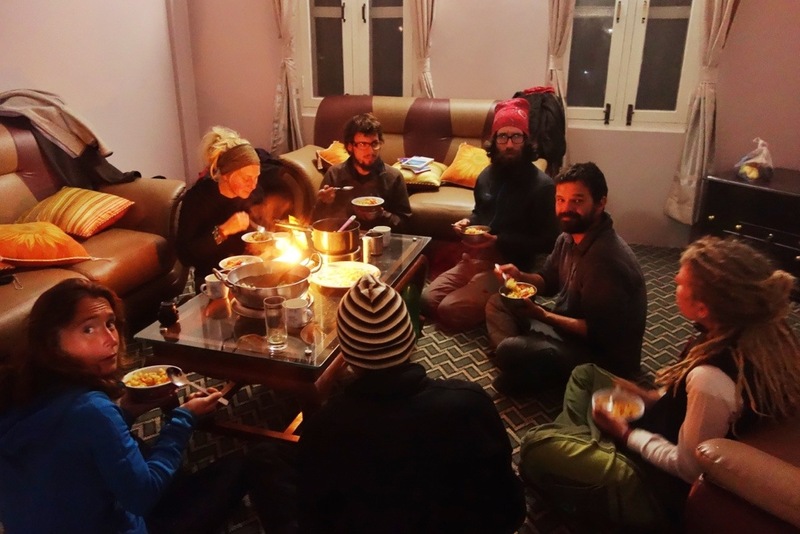 This entry was posted in Nepal and tagged Cycling around the world, cycling Nepal, Cyclists discuss, cyclists talk, meeting other cyclists, Nepal, pokhara by The Wandering Nomads. Bookmark the permalink.